Blockchain, augmented reality, Internet of Things (IoT), and voice interfaces will have big business implications. Augmented reality will become a shopping paradise, webpages will start to give way to screen-less voice interactions, blockchain technology will create a business worth $10 billion, and the Internet of Things will save $1 trillion a year by 2022. Those items reflect Gartner’s crystal ball predictions for 2017 and beyond. The predictions were outlined at the Gartner Symposium/ITxpo in Orlando. The theme for the conference is digital transformation, experiences, and engagement. Jason Hiner at TechRepublic is looking at the implications for IT as these trends play out, but it’s worth looking here at the business takeaways amid the tech shifts. 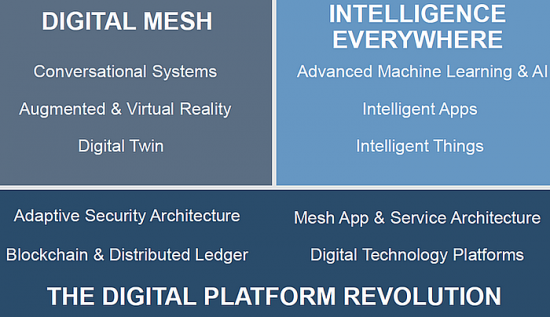 In a slide, here’s a look at the technologies companies will have to put together and navigate. At the very least, the slide provides a starter set for a tech buzzword drinking game. Here’s a between-the-lines reading of Gartner’s prognostications. By 2020, 100 million consumers will shop in augmented reality. Gartner analysts Daryl Plummer and David Cearley argued that AR will go mainstream. Retailers will use AR to boost the shopping experience as digital information blends with the physical. My take: I’ll argue that AR has the potential to be the savior of malls and physical shopping. AR is one of the few technologies that may allow retailers compete with Amazon. The 100 million consumer figure seems a bit high given development tools are just being built, and beyond Pokemon Go, AR hasn’t landed the masses. Another wild card: retailers don’t have the expertise to really take advantage of AR by 2020. AR will have a much bigger impact on healthcare, modeling, training, and simulations. By 2020, 30 percent of web browsing sessions will be done without a screen. Gartner’s take is that Google Home (unproven and resembles an air freshener) and Amazon Echo (successful) will usher in voice-first interaction. My take: Companies need to prepare for the post-webpage and app era. I’d argue that the percentage of non-browser web interactions could be higher. Another point to ponder: kids who are tethered to their smartphones non-stop will have such repetitive stress injuries that they’ll have to go with voice interactions to function. It’s generation RSI. By 2019, 20 percent of brands will abandon their mobile apps. Gartner said that returns on apps will not justify the investment. Companies will let apps expire. My take: Just 20 percent? C’mon. Mobile apps require support for two platforms, upkeep ongoing and the risk of poor ratings. Meanwhile, mobile apps aren’t delivering returns in most cases. I’ll up that percentage to 35 percent. My take: Algorithms will reinvent entire industries. Gartner takes the positive view. I can see 2020 as a timeline for algorithm-enhanced work and decision-making. However, I can also see 2020 as a time where algorithms will replace humans. Why screw with some defective decision driven by a worker “emotionally charged and factually drained”? By 2022, a blockchain-based business will be worth $10 billion. Gartner’s prediction is that blockchain technology will revamp how transactions are conducted. My take: Blockchain technology is immature but is attracting funding. The 2022 time frame may be a bit of a leap. Another blockchain point to note is that it’s difficult to sort through the vendors playing in the space and tossing out buzzwords as marketing fodder. By 2021, 20 percent of all activities an individual engages in will involve at least one the top seven digital giants. Gartner said that Google, Apple, Facebook, Amazon, Baidu, Alibaba, and Tencent will be in so many places that they will have touch points in all aspects of life. My take: I’d agree with that 20 percent prediction, but I would say the list may shift. Apple – unless it truly gets the services business down – and Alibaba may not make the cut globally. Through 2019, every $1 enterprises invest in innovation will require an additional $7 in core execution. Gartner hits a key point. Spending on innovation and ideation is one thing. Deploying that big idea or technology is another item entirely. My take: Execution matters and there’s no way that enterprises are all going to nail so-called bimodal IT as they bridge to digital business. Through 2020, IoT will increase datacenter storage demand by less than 3 percent. Gartner said that sensor data won’t tax existing storage infrastructure. My take: The wild card here is whether enterprises will keep IoT sensor data if using their own datacenters. Companies are also likely to use cloud services so the datacenter storage demand will be someone else’s problem. By 2022, IoT will save consumers and businesses $1 trillion a year in maintenance, services, and consumables. Gartner said the challenge will be delivering savings over two decades without boosting management costs. My take: The savings argument is clear, but Gartner’s argument depends on inexpensive monitoring and analytics. We’ll see. By 2020, 40 percent of employees can cut their healthcare costs by wearing a fitness tracker. Companies will hire fitness program managers to work with HR execs, said Gartner. My take: The caveat from Gartner is that the health care data will cut costs only if “the patient agrees to share it.” In other words, the fit will land discounts and share data. The not-so-fit will view wearables as a Big Brother privacy invasion.